Good has nothing going for it in this movie. The last violent scene felt like the punch line to the whole movie: Not even random bad luck can stop an evil man. In contrast, Moss (Josh Brolin) refuses to abandon or even mess around on his wife and for this he gets greased by a truck full of Mexican drug dealers. 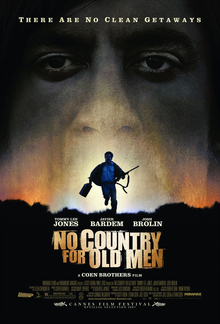 Sheriff Bell (Tommy Lee Jones) is a good guy, but he can’t stop even a single one of the bad things that happens. The old man with the cats saying he would forgive the person who (presumably) had put him in the chair is good, but his situation is pretty bleak. Hell, Moss would have gotten off scot-free if not for his need to do a good deed. Chigurh (Javier Bardem), the bad guy with the bad hair (and an unpronounceable name), steals the show. The scene with the coin and the old Texas gas station attendant is more effective at articulating an evil character than anything else from recent memory. And it contains no blood. Have you read the book, Tim? It’s a difficult read, like most of Cormac McCarthy, but it’s beautifully nuanced if a person goes about chewing on it slowly. I was so excited with this story I immediately gave the book to my son who also found it difficult to read. I hardly noticed. It was my introduction to McCarthy and I enjoyed it thoroughly. I haven’t enjoyed The Road as much (have yet to finish it, for that matter). Not sure why. I am surprised the Coen’s adapted the story so faithfully. It’s such an unrelenting, dark story. Hardly a Hollywood movie, but pitch perfect for these dark days.